Micabox truly combine ancient and modern Japan. Kagura (music for the gods) minyo (local folk) and other Oriental sounds are mixed with the cutting edge electronics of Toshimi Mikami, together with help of the superb female vocalist Ayako Takato. Toshimi Mikami who has long been fascinated by the possibilities of electronic music, cites Haruomi Hosono among his main influences. He is not alone. Hosono who mixed and adds additional sounds on the Micabox album, Hinemosu, has been a pioneering musician in Japan for several decades, at the forefront of creating Japanese rock music with the group Happy End, technopop with his group Yellow Magic Orchestra (along with Ryuichi Sakamoto and Yukihiro Takahashi) world music and electronic dance music. When the term world music first came into wider usage in the mid 1980s, like other Japanese, Toshimi Mikami wondered what his own country had to offer. It took him a while to find it, but he discovered two types of homegrown music; kagura and minyo. 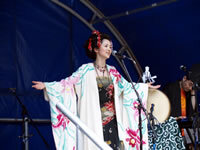 Kagura ‘god music’ is music and dance played at shrines, and is probably Japan’s most ancient surviving music. It has its roots in acts of magic in worship of the gods inhabiting the forest and sea. 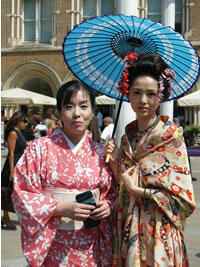 It has incorporated elements of noh and kabuki theatre, including the use of elaborate masks. Some of the instruments include the simple bamboo flute, the takebue and the large odaiko and smaller taiko drums. Minyo meanwhile are local Japanese folk songs of which literally thousands exist, from the far north of Hokkaido to the deep south of Okinawa. Themes include fishermen pulling in nets, farmers planting crops, lullabies and weddings. Performers of minyo and other traditional styles belong mostly to quite conservative associations and updated versions are not always welcomed. It wasn’t until he met female singer Ayako Takato in the Pan-Pacific Mongoloid Unit, a group run by Haruomi Hosono of which Mikami is also a member that Mikami had found a singer with the versatility to sing the tunes he had composed over a number of years. Thus Micabox was born. 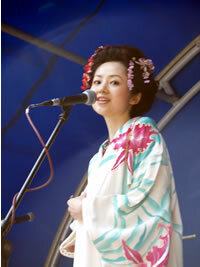 Hosono discovered Takato after she had sent him a recording of her extraordinary voice. She had classical training, had tried singing pop music, but it wasn’t until she joined the Pan-Pacific Mongoloid Unit and heard Mikami’s compositions that she found the music most suited to her voice. She too became fascinated with the worlds of kagura and minyo. Aside to performing together in the Pan-Pacific Mongoloid Unit, Toshimi Mikami is also a member’s latest group, Tokyo Shyness. Micabox combine these ancient Japanese traditions and from other Asian countries especially China and Thailand with Mikami’s innovative electronic accompaniment. It sounds a bit like a snapshot of today’s Japan; where the grounds of an ancient, peaceful temple stands adjacent to the blazing neon of an advertising hoard. A curious mixture of the old and new, spiritual and hi-tech, serenity and radicalism.